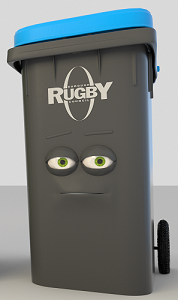 The blue-lid bin will take all of your "dry recyclables". Please rinse your recycling to make sure everything is as clean as possible before putting it straight into your bin - don't put anything in plastic bags or bin bags or it won't get recycled. General waste, compostable waste and food waste must not be put in the blue-lid bin. These waste sources contaminate the entire lorry load and may cause the load to be tipped instead of recycled.